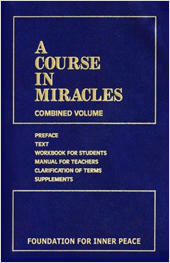 One of the most beloved books of modern times, A Course in Miracles is a self-study course in spiritual psychotherapy and a profound text focusing on the principles of universal love and forgiveness. It has had a revelatory impact on people of many faiths and religious backgrounds. Printed on thin bible paper, it consists of the 660-page Text, the 480-page Workbook for Students, and the 90-page Manual for Teachers, bound together in one volume.